Height adjustable, free standing mount for monitors and tablet enclosures. Perfect for trade shows and temporary installations. 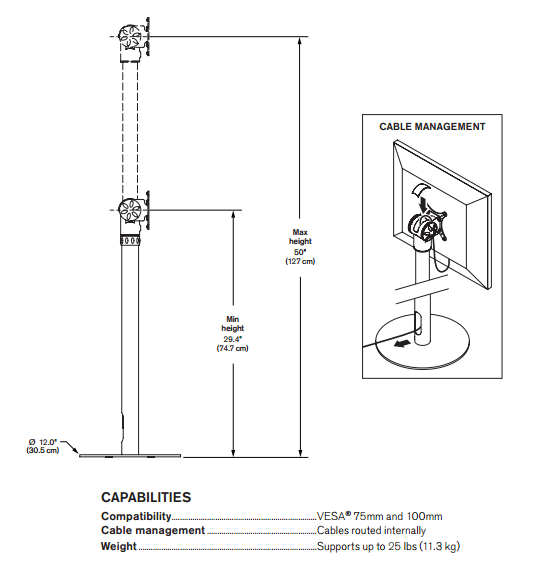 Monitor mount model 9230 is a free standing pole mount that can be used to mount both flat panel monitors and tablets. This adjustable monitor mount is perfect for trade shows, education, retail, hospitality, and more – anywhere there is a need to temporarily set up a kiosk or digital display. 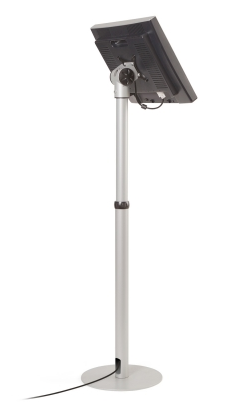 Model 9230 is a free standing pole mount that can be used to mount both LCD monitors and tablets. Weighted base and sturdy construction protects your IT investment. Route power cable through tube. Height adjustable—max height of 50-inches. Multiple mounting options for both flat screen monitors and tablets up to 25 lbs.